ISLA works to empower Hispanic youth and their communities to become bilingual, global citizens through innovative heritage language and cultural immersion programs. As a Latino community-led non-profit based in Chapel Hill, North Carolina, ISLA offers multiple innovative programs to open doors, build confidence for Latino youth, connect diverse communities, and to strengthen multicultural identity and Spanish literacy as assets for future academic, personal, and career pursuits. ISLA’s flagship initiative, the Saturday Heritage Language Program, provides high-quality Spanish instruction for heritage speakers that aims to build confidence and community while closing the academic achievement gap between Latino and non-Latino students. The program targets low-income Latino families and is free to participants. Through various programs including the Spanish heritage language program, ISLA serves hundreds of children and adults each year from multiple counties in North Carolina. 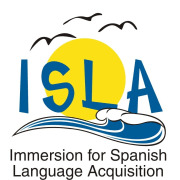 Would you recommend IMMERSION FOR SPANISH LANGUAGE ACQUISITION?